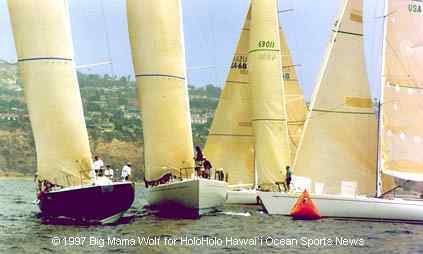 Honolulu, HI (July 5, 1997) -- Racing a sailboat is all about weather -- and whether there's wind or not. 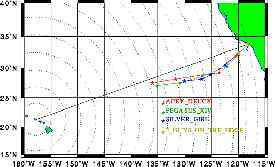 When the Cruising Class division of the 39th biennial Trans Pacific Yacht Race started last week they had more wind than they needed. When the Small Boat racing class started on July 2 they picked up good winds and are currently gaining on the Cruisers , with both divisions surfing downwind in 15-20 knot winds and six-foot seas. But today's much anticipated Mai-Turbo-Sled start off Point Fermin in San Pedro, California, was a drifting match. This time there was less than five knots of wind at the 1 pm gun that sent 16 sleek 70-foot maxi-turbo-sleds and standard sleds off in he 2,225-nautical mile race, and that soon died to 2 or 3 knots -- barely enough to fill the massive sails. Tomorrow's daily roll call will make the day for those boats already at sea (when they hear how the faster boats that are trying to catch them) got off to such an agonizingly slow start today. One race veteran called it the slowest start of the biennial race since 1973 when even lighter zephyrs pushed the boats across the line trying to fly spinnakers, which are downwind sails seldom used for starting. 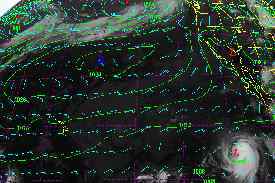 The two fleets started on opposite sides of a split line facing the west end of Santa Catalina Island, 22 miles out, while their crews sat to leeward to induce heel angles that might coax an extra tenth of a knot out of the boats. "Things start to get interesting"
All the boats started on port tack (wind coming over the left side), and Doug Baker's new maxi-turbo Magnitude, from Long Beach, appeared to have the best start of all. 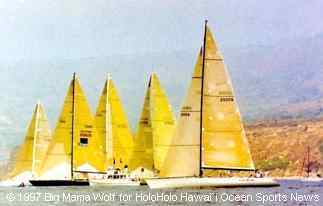 James McDowell's standard sled Grand Illusion, from Lahaina Yacht Club, had the worst. Grand Illusion miss-timed its approach, arrived early at the starting line, and while it was taking nearly two minutes to circle and return (a requirement when a boat crosses early), the rest of the boats were away. "They start, see Pyewacket charging in after pushing Merlin out"
Among the maxi-turbo's, Tony Session's Luna Barba from Vancouver, and Mike Campbell's Victoria , Long Beach, followed Magnitude across, while Scott Campbell's two-time winner Ragtime , Newport Beach, followed the leaders across. The only boats still to start are three large multihulls scheduled for 1 pm Monday. Bruno Peyron, skipper of the giant catamaran Explorer , from France, is asking to have the start delayed a day because Explorer isn't expected to reach Long Beach until Sunday evening after an arduous voyage from Europe. Meanwhile, among boats that started earlier, Bob Lane's Medicine Man , Long Beach, covered 276 miles for the second consecutive day to take another 101 miles out of the lead of the Cruising Class leader Salsipuedes . Salsipuedes had a four day head start on Medicine Man and leads by 513 miles, with 1,030 to go. 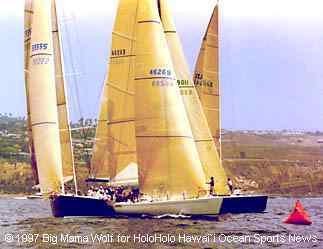 Bay Wolf's all women crew worked 24 hours to complete repairs of their mainsail, but needs to make up 40 miles to get back in contention. 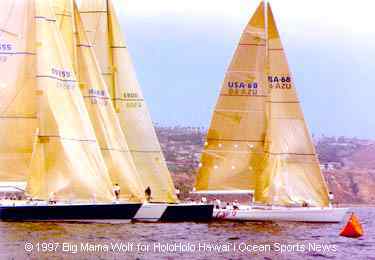 Hawaii's Dan Doyle and Patrick Rogers aboard the jury rigged 2 Guys on The Edge returned safely to Long Beach after breaking the rudder. RANDOM PICKS FROM THE TRANSPAC SCRAPBOOK: Jack Smock wrote in his "History of the Transpac:" "The ancient Greeks would have loved the 1953 Honolulu Race. For this was the year the Gods decided to remind the Transpac racing fraternity, which had been growing increasingly cocky, that they might know a lot about the weather but they still couldn't control it."